Health and Safety with Pictogram sign. "SAFETY FIRST" indicates proper safety procedures which, if disregarded, could result in personal harm. 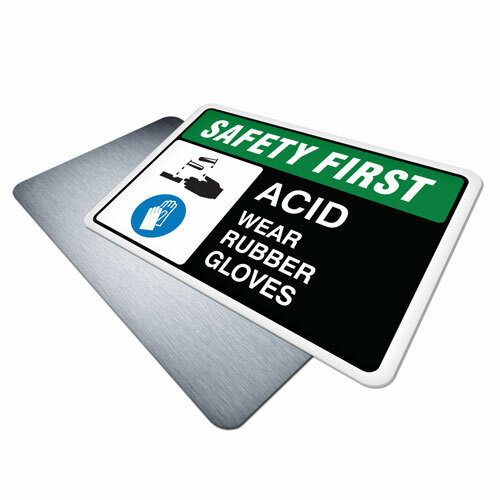 "Acid (Wear Rubber Gloves" sign displays the Danger message with pictogram and can be manufactured as a label or an aluminum sign. Both are compliant with ANSI standard Z535. Ensure sign is posted in an obvious place so employees and visitors will read and follow instructions before entering the area. Also correct gloves must be provided. This PPE safety sign is used to describe the hazard of acid splashing and the potential for getti..